The main difference between oxyhemoglobin and deoxyhemoglobin is that the oxyhemoglobin is the form of hemoglobin loosely combined with oxygen whereas the deoxyhemoglobin is the form of hemoglobin that has released its bound oxygen. Furthermore, the oxyhemoglobin is bright red in color while the deoxyhemoglobin is purplish in color. Oxyhemoglobin and deoxyhemoglobin are two forms of hemoglobin found inside the blood vessels. Both are associated with red blood cells. The main function of hemoglobin is to carry oxygen to the metabolizing tissue in the vertebrate body. Oxyhemoglobin is the oxygen-bound form of hemoglobin. During respiration in the lungs, the hemoglobin component of the red blood cells is exposed to oxygen and loosely bound to it. The binding of oxygen into hemoglobin occurs at high pH, low carbon dioxide, and high-temperature conditions of the blood, which generally occurs inside the lungs. With the binding of the first oxygen molecule to the iron (II), the heme pulls the iron (II) into the porphyrin ring. This slight conformational shift encourages the binding of another three oxygen molecules to the hemoglobin. Ultimately, oxyhemoglobin contains four bound oxygen molecules in its fully saturated form. Therefore, oxyhemoglobin is considered to be in the relaxed (R) state of hemoglobin. Blood that carries oxyhemoglobin is called oxygenated blood. Oxygenated blood flows through arteries, away from the heart under the force generated by the heart. The color of oxygenated blood is bright red. When oxyhemoglobin drops oxygen at the cells, oxygen is used as the final electron acceptor by a process known as oxidative phosphorylation during the production of ATP. 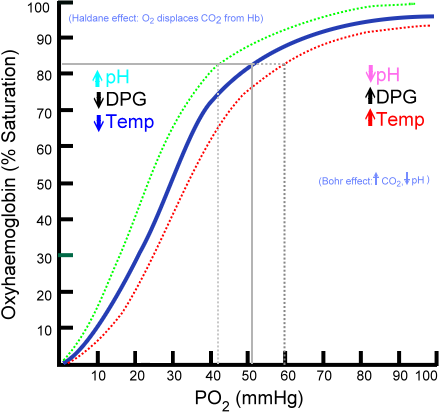 The removal of oxygen from the blood causes a drop in the pH of the blood. Deoxyhemoglobin is the hemoglobin that has released oxygen. The release of oxygen occurs at the metabolizing tissue due to the low pH, high carbon dioxide concentration, and low temperature. Deoxyhemoglobin is the tensed (T) state of hemoglobin due to the release of oxygen molecules. Deoxyhemoglobin, which is purplish in color, is transported towards the heart through veins. Blood with deoxyhemoglobin is known as deoxygenated blood. It can bind with oxygen inside the lungs, forming oxyhemoglobin, which in turn, increases the pH of the blood. Oxyhemoglobin and deoxyhemoglobin are two forms of hemoglobin, classified based on their oxygen-bound stage. Both forms of hemoglobin are associated with red blood cells. Oxyhemoglobin refers to a bright red substance formed by the combination of hemoglobin with oxygen while deoxyhemoglobin refers to hemoglobin not combined with oxygen. Furthermore, oxyhemoglobin carries four oxygen molecules at its saturated stage while deoxyhemoglobin carries no oxygen molecules. Moreover, oxyhemoglobin is the relaxed state of hemoglobin while deoxyhemoglobin is the tensed state of hemoglobin. In addition, oxyhemoglobin has a significantly lower absorption, which occurs at 660 nm while deoxyhemoglobin has a higher absorption, which occurs at 940 nm. Also, oxyhemoglobin is diamagnetic, weakly repulsed by the magnetic field while deoxyhemoglobin is paramagnetic, weakly attracted by the magnetic field. Besides, oxyhemoglobin occurs in oxygenated blood while deoxyhemoglobin occurs in deoxygenated blood. 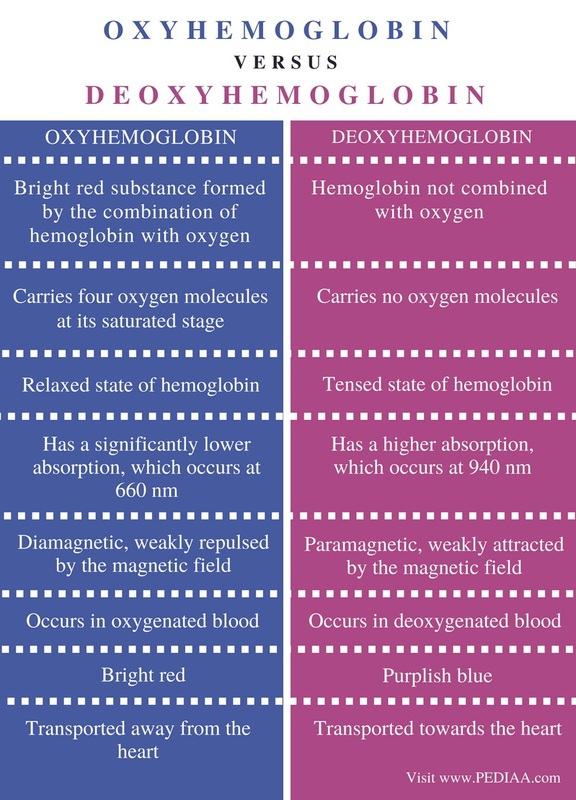 Additionally, the color of oxyhemoglobin is bright red while the color of deoxyhemoglobin is purplish blue. Also, oxyhemoglobin is transported away from the heart while deoxyhemoglobin is transported towards the heart. Furthermore, oxyhemoglobin is transported mainly through arteries while deoxyhemoglobin is transported mainly through veins. Oxyhemoglobin is the oxygen-bound form of hemoglobin, which carries four oxygen molecules in its fully saturated stage. On the other hand, deoxyhemoglobin is the oxygen-released form of hemoglobin, which occurs in the metabolizing tissue. The main difference between oxyhemoglobin and deoxyhemoglobin is the state of carrying oxygen.